↑USS West Virginia (BB-48). 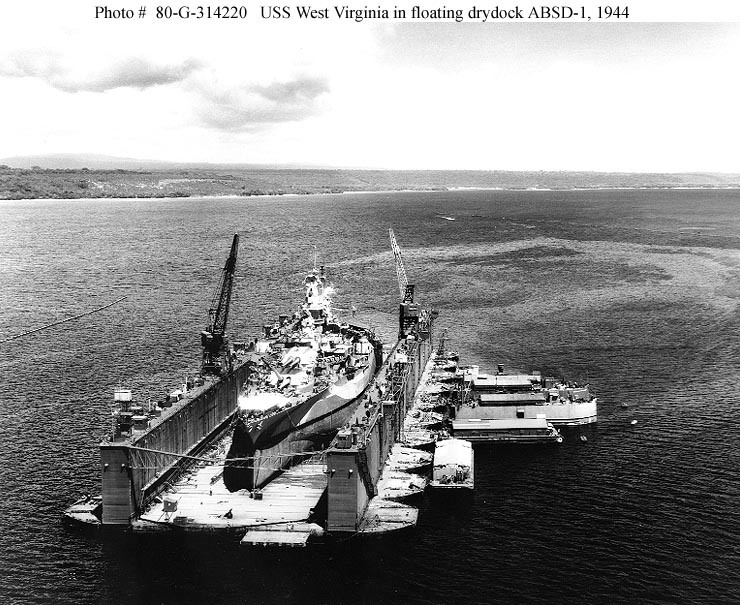 In floating drydock ABSD-1, off Aessi Island, Espiritu Santo, New Hebrides, on 13 November 1944. The battleship was docked for upkeep and repair to propellers damaged when she touched ground off Leyte on 21 October. Official U.S. Navy Photograph, now in the collections of the National Archives. ↑USS Antelope (IX-109). In the floating drydock ABSD-1 at Espiritu Santo, New Hebrides, 8 January 1945. Also in the drydock, astern of Antelope is USS LST-120. YF-326 is the nearest of the yardcraft on the right, moored to ABSD-1. Note that Antelope appears to have an armament of only three 20mm guns, and the rest of her gun tubs are empty. Official U.S. Navy Photograph, now in the collections of the National Archives. — — ASBD-1 Everett Shipbuilding Co.
↑ABSD-3 at Guam, Marianas Islands. Pennsylvania (BB-38) docked in ABSD-3 after the end of World War II. 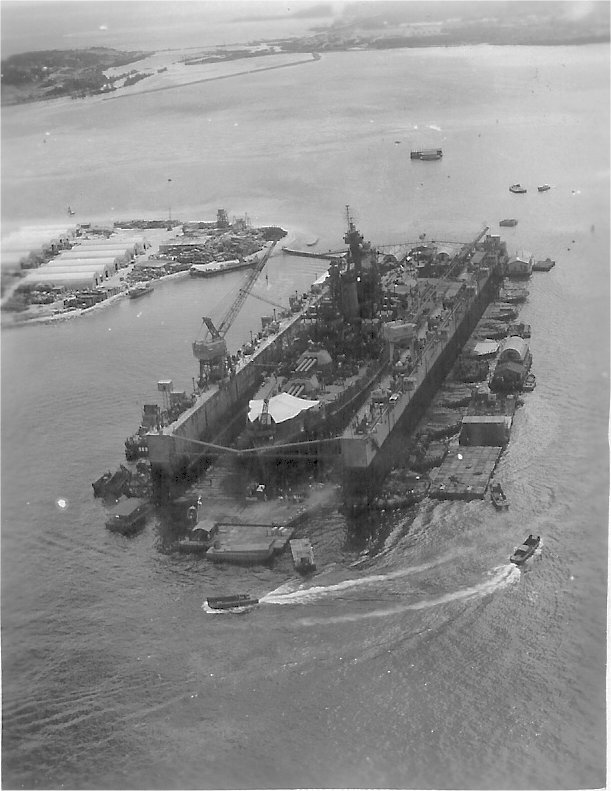 Note the white boxes on the barge, these are coffins that contain the remains of Pennsylvania crewmembers killed during the Kamikaze attack on her at Okinawa, 12 August 1945. 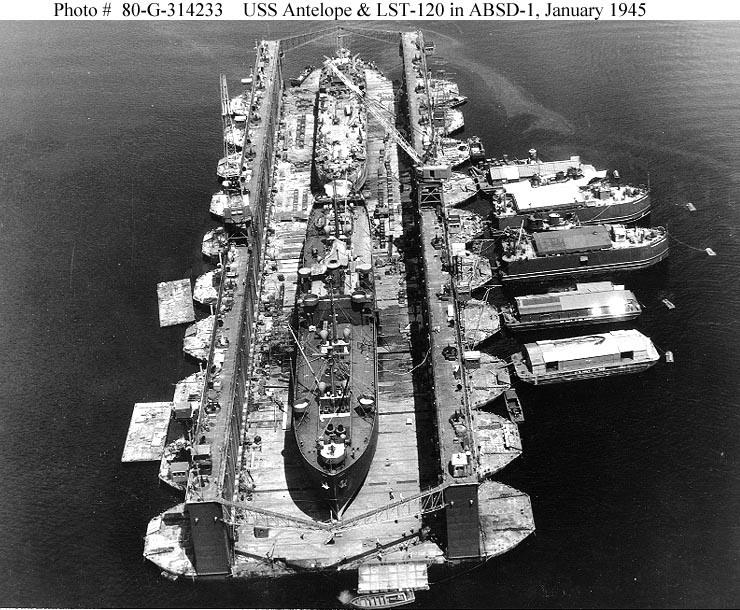 The island at upper left was built between the two drydocks, ABSD-3 and ABSD-6. (ABSD-6 is to the left of the picture.) The island was built for supplies and Enlisted and Officers Clubs, movie theater, etc. US Navy photo. Image courtesy of NavSource.